Yes, you can burn yourself while doing so. I am officially on vacation, having traded the filthy sidewalks, unrelenting heat and constant clamor of New York for the sunny days and deep dark, so-cool-you-need-a-blanket nights of Downeast Maine, at least for the next three weeks. The local cannibals are all busy extorting the tourists, and but for the persistent grinding of the neighbor’s Husqvarna (wood management is a full time job up here), it’s peaceful by the bay in high summer. Lest you think we’re some kind of fish-faced enemies of the people, let me explain how we came to be cottage-owning summer people here in my own home state. If you recall, the Oughts generally (and 2000 to 2007 specifically) were a good time for homeowners in this country. As a result of the vagaries of the New York real estate market and no small amount of luck, Mr. Slattern and I were able to float on the bubble to a ramshackle summer cottage in need of some TLC. In hindsight, we’d have been smarter to tear it down and start over, but that’s a story better suited for scaring the adults around the campfire. Even after extensive renovations, our place is no palace. There’s no foundation, and by mid August the well water begins to smell like it was pumped through a chicken barn. As soon as we drain the pipes and lock up in the fall, red squirrels set up housekeeping in the attic and mice take over the lower levels. The washer and dryer are as temperamental as my elderly relatives, there’s no insulation, and the kitchen is rudimentary at best. You won’t find a dishwasher, Kitchen Aid mixer or food processor, the stove is completely unreliable — one day underpowered, the next day incinerating entire meals when set at an innocent 325 degrees, and no matter where I stow the fruits and vegetables, the fruit flies find them. Of course it’s a damned sight better than when we bought it. Thanks to the indefatigable efforts of my family, and my mother’s total renovating genius (she could do a whole house over in a week with $200, a ladder and ten yards of fabric), the sad, dark, dirty mess has been transformed to a cheery, productive space suitable for guests, so long as they’re not terribly germ-phobic. This is, in fact, the one place I actually enjoy cooking. Partly, I suppose, it’s because we usually have a houseful of company, which creates a party atmosphere, especially at sundown, and cooking while cocktail hour is in full swing is far more fun than the usual Tuesday night, get-it-done-so-I-can-prepare-for-tomorrow’s-early-meeting approach to dinner. I also like that there’s no schedule. Dinner happens when it happens, and no one seems particularly worried about having adequate time to digest following the evening meal. We just stay up until the stomach does its thing and we feel like sleeping, or the wine runs out, whichever comes first. There’s also abundant local produce and seafood to choose from this time of year, so we just eat whatever’s at the farm stand or the fish market at the moment. But more than anything else it’s this place that makes me want to dust off the oven mitts. The first summer we were here, my favorite aunt — Arlene, my grandmother’s older sister actually — came for a visit. It was cold, but we all sat outside and chatted, and Aunt Arlene told me about visiting her grandmother on this same point as a child in the 1920s. It was here that Grammie Sprague settled later in life after leaving the farm, she said, and right over there across the bridge where she was buried. The children loved it here and would poke around on the beach all day, searching for starfish, picking mussels and digging clams. Back then, Aunt Arlene recalled, the children weren’t allowed outside at night because there were Klan meetings in the area, and they were Catholic. I guess since there were no black folks to persecute, the local racists made do with Papists. That’s Yankee ingenuity for you. It was pure coincidence that we landed on this spot — none of my family has lived here since my great great grandmother’s time, and I had no idea even that she had — and yet I feel connected to this place in a way I don’t feel part of any other. And so I bake blueberry rhubarb pies in my summer kitchen, churn homemade ice cream in the hope the freezer will stay cold enough for it to set, and bake beans in the old crock I dug out of my mother’s kitchen. Coconut: Toasted up and ready for freezing. Happy as I am here, I frequently screw things up, as when I served seafood chowder so overcooked the lobster was like gum rubber and the potatoes had all but disintegrated. Then there was the time I forgot to add the liquid to a pot roast I was cooking in the crock pot — it came out like bacon cooked with a flame thrower. It still takes me a while to adjust to a slower pace. This morning I decided to add toasted coconut to the Nutella-flavored frozen yogurt I was was making and as I rushed to assemble it, grabbed the pan handle immediately after removing the toasty, brown coconut from the oven. I burned the hell out of my left hand, but happily there was a big bag of frozen blueberries in the freezer to hold onto until the pain subsided. The frogurt turned out to be delicious. Aunt Arlene would have loved it. She had a real sweet tooth. Spread half a bag of sweetened shredded coconut in a baking dish and toast in 350 degree oven until golden brown. Remove from oven and let cool completely. Add to ice cream maker and churn until frozen and thick. 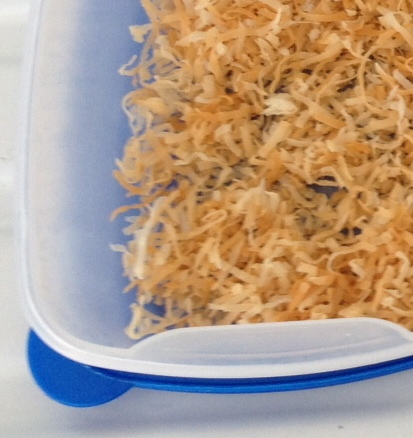 Spread the coconut in the bottom of a plastic container with a lid. Pour the churned frozen yogurt mixture over the coconut, cover and freeze. All images are the property of WS Winslow. Please use only with attribution. Posted on August 6, 2012, in Dessert, Life and times and tagged family, frozen yogurt, Humor, Maine, Nutella, Summer, Vacation. Bookmark the permalink. 20 Comments. Love the kitchen renovation. Makes me think of Martha…erm, forget it. Funny how we are drawn back to the places where we have roots. It’s as though the minerals in the soil, the smell of the air, the bite in the wind become ingrained in our DNA so that a particular town or part of the country can tug at our hearts in a way that other similarly charming places simply don’t. Well put and completely correct. Your summer kitchen sounds like paradise. Especially with the makeover you gave it and the family history. I can see why you’d want to cook more when you’re there. And your aunt must have been such a doll! Awesome post! That I want to cook at all is a minor miracle at this point. Always nice to see you, Audrey. The transformation of the kitchen looks great. I thinking contentment and the desire to cook must go hand in hand. Now there’s a thought worth pursuing. Enjoy the vacation. We all need to get away. Truer words were never spoken. Thanks, Tom. HOLY CRAP! That is an awesome makeover! Love the red. Have fun in the land of lobster. I’m jealous. 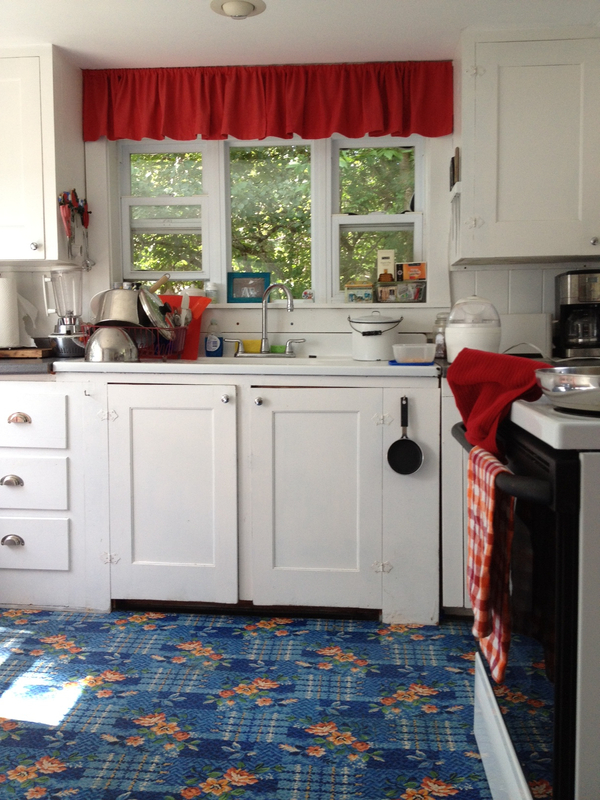 A coat of white paint and some reclaimed linoleum can be miraculous. Damn that is a wicked combination for ice cream. I must make for us. Unless it was published in People magazine, I did not. I’m on vacation, Jed. I have found that the way people do anything is the way they do everything, my friend. Draw your own conclusions. Understood. Btw great job on the renovation. It’s all my mother’s doing. As with everything really. Still can’t get over the god yogurt, eh? 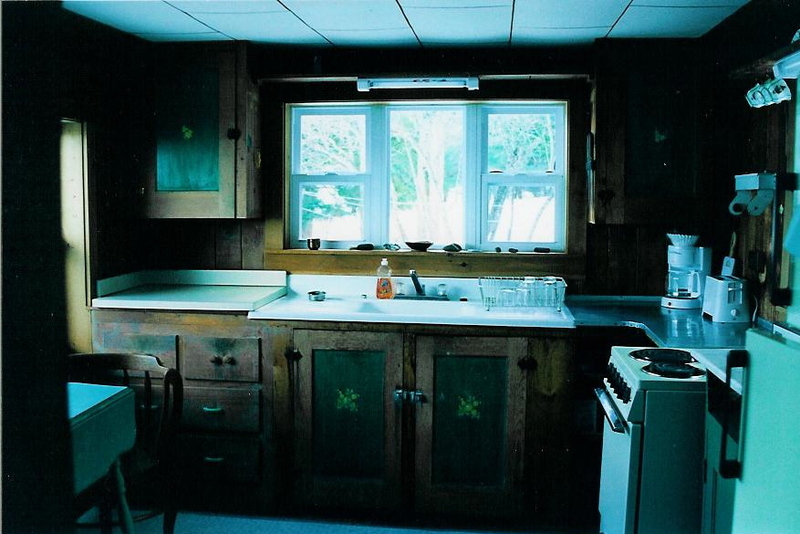 And the transformation of your kitchen is incredible! Ever think about doing a traveling renovation show in my part of the country? All the god yogurt you can eat! If you’ll translate, I’ll work for carbs. Nothing like a summer cottage. Sounds like heaven. And the yogurt sounds good too.